Crunching into an almond, it’s hard to imagine the journey that little nut took to make its way to your mouth. 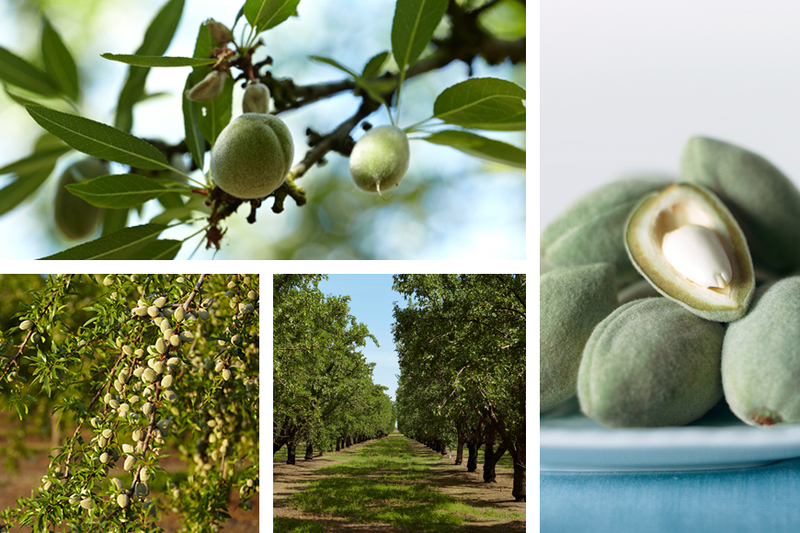 Grown in California’s ideal Mediterranean climate, the annual almond lifecycle has many stages and an abundance of natural beauty. Almond farming is a long-term commitment. Orchards generally produce for 25 years, yielding their first crop three years after planting. 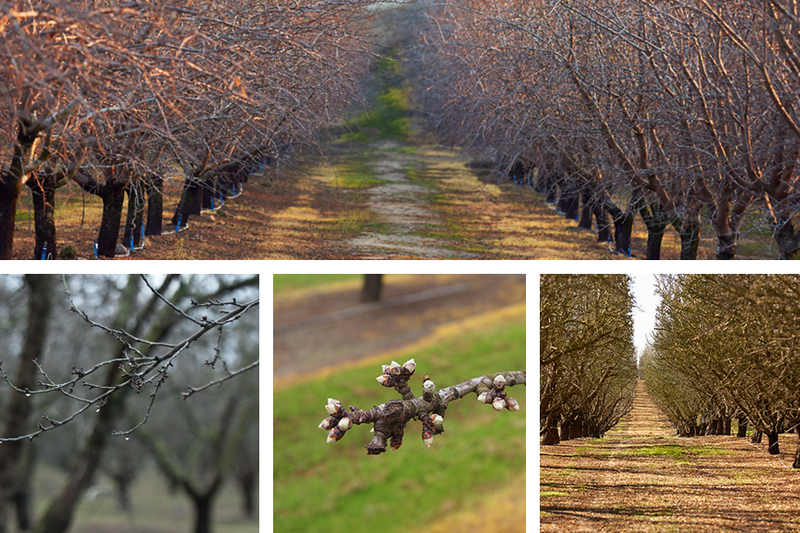 November until January, almond trees go through a period of dormancy, losing their leaves and chilling out in California’s cool, wet winters. Orchard soils store up rainwater for the upcoming growing season, and the trees store nutrients and energy for next year’s crop. Toward the end of dormancy, buds begin swelling on each tree’s branches in preparation for bloom. Between mid-February and mid-March, almond tree buds burst into beautiful white and light pink blooms. 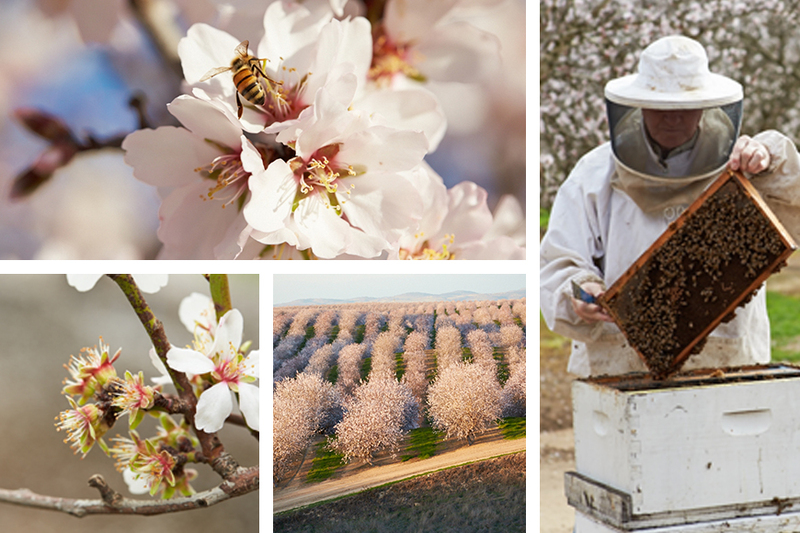 Most almond trees are not self-pollinating, so orchards are grown with multiple almond varieties, and beekeepers bring hives of honey bees to orchards to provide the missing piece of the puzzle. As the trees blossom, the bees forage for pollen and nectar in the orchard. When they move from tree to tree, they pollinate almond blossoms along the way. Every almond you eat exists because a honey bee pollinated an almond blossom. And every honey bee that visits an almond orchard gets its first natural food source of the year there, supporting it with a healthy start1 as it moves on to pollinate other crops across the nation. From March to June, almond kernels mature and grow to full size, with the shell hardening around it—both protected by a fuzzy outer hull. Once the spring rains stop and the weather heats up, farmers begin irrigating their orchards to support the growing crop, taking great care to ensure each drop of water is used responsibly and efficiently. Also at this time, green almonds can be harvested for various culinary uses. In July, almond hulls split open, exposing the almond shell and allowing it and the kernel inside to dry. Shortly before harvest, the hulls turn a straw-yellow colour and open completely. 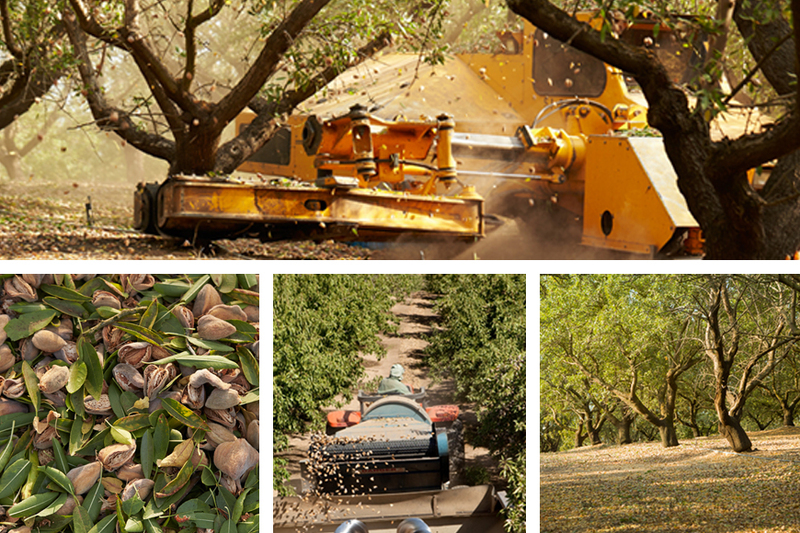 From August until October, mechanical tree "shakers" harvest the almonds by vigorously shaking them to the ground. The almonds then dry naturally in the warm California sun for 7–10 days before being swept into rows by a “sweeper” machine. After that, a harvester or “pickup” machine drives over the rows, vacuuming the nuts up into a cart that brings them to the edge of the orchard for transport to the next stop on their journey. 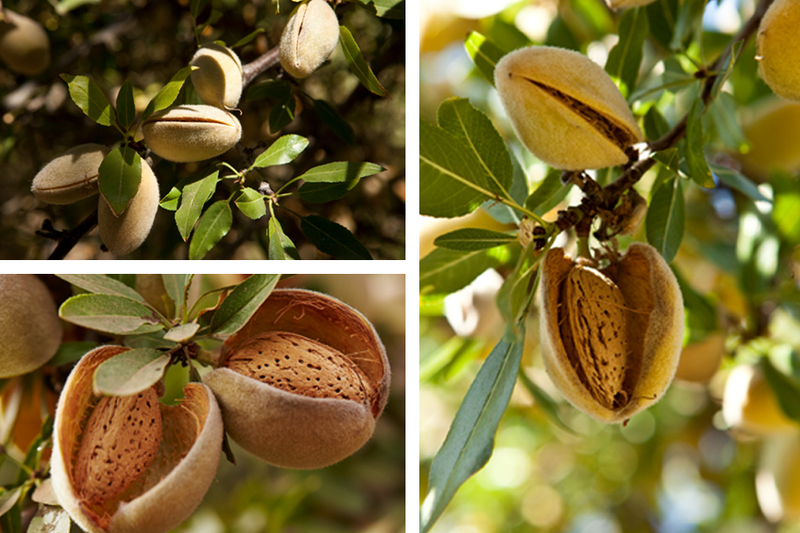 Each almond variety is harvested separately, so this process typically happens two to three times per orchard. Also during this period, almond trees begin building the pieces that will become the next year’s crop, so farmers take care to give the trees what they need for this important stage. After harvest, almonds go to a huller/sheller facility where the kernels pass through a roller to remove the hull, shell and any debris from the orchard, such as sticks and rocks. Almond farmers practice a zero-waste approach, ensuring everything an orchard produces is put to use. Almond shells are used as livestock bedding, and hulls are valuable dairy feed, with research underway exploring new potential uses. Next stop: the processor for sizing, where the almond kernels drop into separate bins according to size. 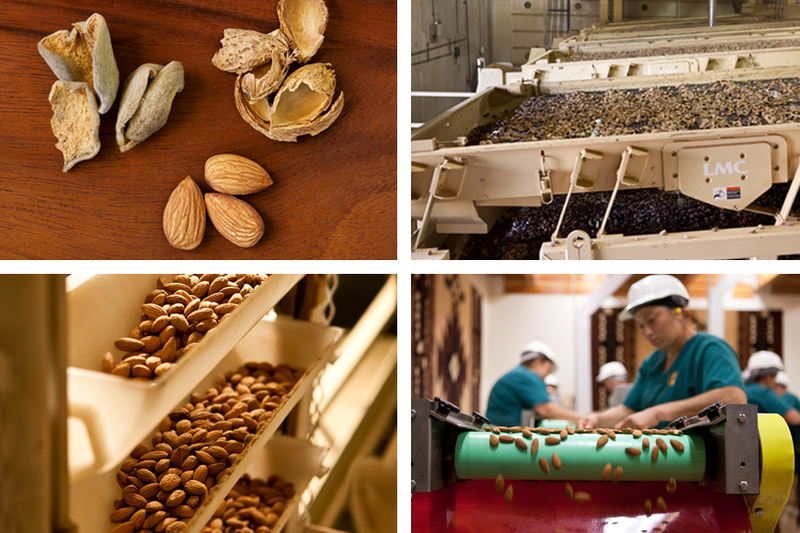 After sizing, almonds are kept in controlled storage conditions to maintain quality until they're either shipped or further processed into a variety of different almond forms for diverse culinary uses. 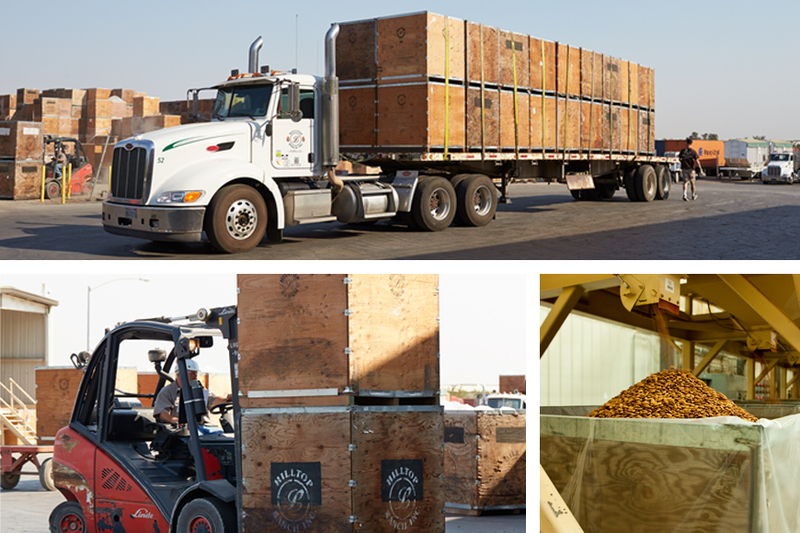 Producing 80% of the world’s supply, California Almonds make their way to almond lovers in over 90 countries worldwide. And the biggest almond lovers are right here in the U.S., where over 30% of almonds grown in California each year are consumed. Almonds are enjoyed in many ways, occasions and locations! 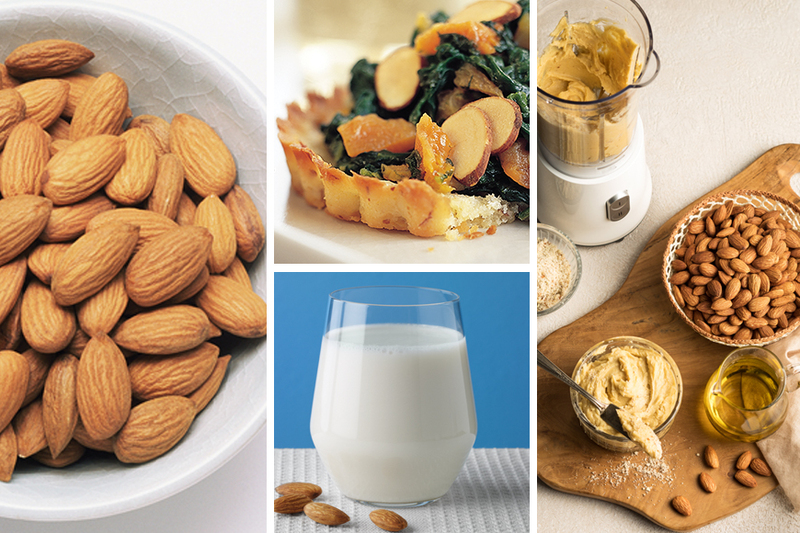 From whole almonds to blanched, sliced and diced ones—as well as almond flour, paste, butter, oil, milk and more—almonds are incredibly versatile, satisfying and packed with powerful nutrition, supporting healthy and diverse diets the world over.